Versions of this cake are made at smart restaurants all around Britain, but it's actually very simple - especially as it requires no icing, a skill I have yet to acquire. In California, where the recipe originated, they use a small proportion of unsweetened chocolate (100% cocoa solids) which is not currently obtainable in the UK, but using Waitrose Dark Continental Chocolate (72% cocoa solids) gives an equally excellent result. Preheat the oven to 190°C, gas mark 5. Grease a 23cm round springform tin and line with baking parchment. Melt the butter and chocolate together in a pan, then set aside. Beat the egg yolks and sugar together gently until just mixed. Stir in the melted chocolate and butter, then stir in the flour and ground almonds. Whisk the egg whites and cream of tartar until creamy and they form soft peaks - do not overbeat or the cake will end up dry. Egg whites whisk best at room temperature rather than straight from the fridge. Fold the whisked egg whites carefully into the chocolate mixture, then pile into the tin. 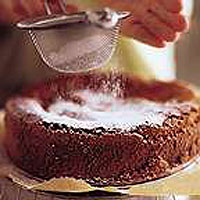 Bake for 40-50 minutes, until the cake is set around the outside but has a tiny soft and creamy circle in the centre. The centre should wiggle just slightly when you gently shake the tin. Leave to cool in the tin, then transfer to a plate. Ideally serve still fractionally warm, dusted with icing sugar and with a dollop of crème fraîche.